Aloha Stadium Swap Meet, a famous swap meet which is one of the largest Flea markets in Hawaii. This swap meet is Hawaii’s largest open air flea market where the locals shop for the best deals in town. Open three days a week, they offer endless rows of over 400 local merchants offering the best value on imported merchandise, handmade items, eclectic art pieces, popular local snacks and other made in Hawaii products. Located at Hawaii’s largest sports venue, the Aloha Stadium Swap Meet is a place where families can gather to share their cultural diversity with pride and a feeling of Aloha. After shopping the seemingly endless rows of bargains, don’t forget to pick yourself up some sweet Hawaiian fruits and refreshing coconuts. 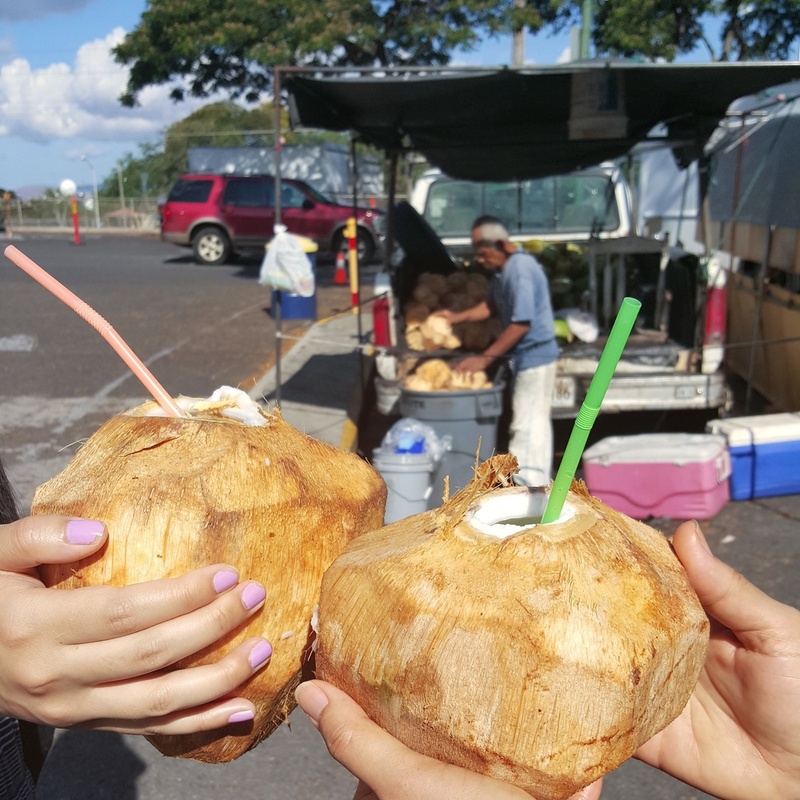 The fresh coconuts are one of the best parts of this swap meet! The coconut is cut open in front of you with a machete! After you finish drinking your coconut water, bring it back to the man with the machete to have the coconut cut in half. You can eat the coconut meat! He ended up cutting a piece of the coconut shell that became out makeshift spoon. Using the spoon, we scraped the layer of coconut meat loose. Yum! I recommend showing up early because it does get crowded and HOT! Bring a hat, sunscreen, water and your sunnies.